By 2030, all baby boomers will have turned 65. Most will have retired; many will have downsized to save money, and others will have moved to follow their dreams. For couples, the retirement transition was likely stressful. Whether to stay put or where to move in retirement being a major source of that stress. Envision the scenario where your husband announces one day that he is retiring, wants to sell the house, and finally realize the dreams that both of you held as a young couple. It may be visions of moving to the country and growing your own food, buying a farm and raising chickens, living self-sufficiently in a forest off the coast of Oregon, or in a cozy cabin in the woods where life is pure and simple. Let’s not exclude a seaside bungalow where you can swim, and fish, or an apartment in a bustling downtown within walking distance to your heart’s desire. Your husband is gung-ho about the idea, but you are not. After all, this is supposed to be a dream come true for the both of you. Let’s explore some possible objections to moving. Perhaps you are afraid of losing friends, or moving away from beloved grandchildren. Maybe you are afraid to be chastised by family and friends that may call you crazy. And you may ponder whether you still have the gumption to do the things that once enthused you and your husband as a couple. Plus, there are other considerations. How would you fit into a new community? You don’t make friends easily and dread the thought of it. Or, you’re loquacious and afraid you’ll be off-putting. You love your current neighborhood and it could be embarrassing if your new home doesn’t live up to your old one. Your life runs like a well-oiled machine, your life is full, and it would be silly for you and your husband to run away like a couple of teenagers. Everything you need is available where you presently reside. While all of these are valid objections, they stem from fear. #1 Dissolve your fears by facing them. Of course your concerns are worthy of consideration, but they can cause great anxiety thinking about them, especially if the thoughts are negative. It’s widely recognized that thoughts manifest into reality. Cliche’ as it is, thinking of how awful a move with your husband would be will attract just that – an awful experience. On the other hand, thinking positive, of the wonderful adventure to be had, will definitely get you a better result. This piece of advice is particularly relevant for any new challenge that you are faced with. Make your dominant thoughts positive. When you confront your fears and make your dominant thoughts positive ones, your husband’s crazy notion to move may seem less objectionable. Examine your feelings and be truthful with yourself. You may realize that you have fallen into a lifestyle trap that is no longer serving you. Be open-minded about your retirement plans. Don’t be afraid to move your life in a different direction. Many if not all of your fears will dissolve when you embrace change. Perhaps you’ll find Susan David’s bestselling book helpful – Emotional Agility: Get Unstuck, Embrace Change, and Thrive in Work and Life With two hundred positive reviews on Amazon, customers agree that her book is a worthwhile read. Click the Buy Now button below, to check the current price on Amazon. #3 Research before moving brings peace of mind. It doesn’t make sense to relocate to a place that doesn’t offer the experiences that you and your husband are interested in. For example, if you want to retire and raise goats, you will need a home and ranch store conveniently located to your home. If you’re looking for a particular type of recreation, for instance, cycling, make sure the area you are considering is biker friendly. When my husband and I moved from the deep south to the frozen north 12 years ago, we were in agreement on most things. However, at the age of 50, and after 31 years of marriage, it was a monumental lifestyle change. Although we both wanted to move, it created a tremendous amount of stress getting everything in order to do so. After selling the comfortable house in the middle-class neighborhood, we moved into a smaller, but nevertheless, charming home in a walkable town. Everything was wonderful! Our research had paid off. I couldn’t have been happier. Nevertheless, there was a thing or two that I had to adjust to. -The people were friendly, but not in the way that I was accustomed to. I came to realize that it was their respect for individual privacy. It’s one of the things I truly value. Therefore, I came to understand that people are basically the same everywhere you go. I had been judging friendliness on a regional basis. -The locals’ taste in food was lackluster. We had moved from a city renowned for its cuisine and I had to adapt to the idea that a good seafood platter was not going to be found. -Grocery stores did not carry all of the foodstuffs I had used for years. I found substitutes and soon discovered that I could find some of my favorite brands if I took the time to look. -The sun didn’t shine in the winter as often as I wanted, but the change of seasons and the overall climate was magnificent. The wintertime gave me a new appreciation for spring and summer. As you can see, my complaints were all minor inconveniences that worked themselves out. And they may seem trivial compared to your concerns. Here’s my most important tip for what to do. If you do your research and communicate with your husband, you should not have any major complaints about where you move because you will have ironed that out before your relocation. Plus, it is critical to note that you and your husband trust one another. 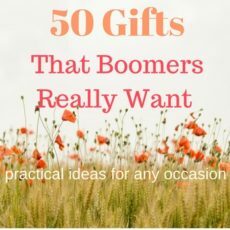 Unless your husband is a selfish ogre, he won’t simply be thinking of himself when it comes to the idea of moving in retirement, but will be thinking of you as well. He will be open to hearing your concerns, and working toward solutions. Most husbands are good men who want to please their wives. Unless you are absolutely against moving, I encourage you to explore the possibility of how a move can be an enriching experience. Giving in to demands from either party will only create misery for the both of you. My article, Don’t Compromise with Your Spouse on Retirement Plans, may be helpful. Your concerns about not wanting to move are valid, but more than likely they are fears that can be addressed and resolved. Relocating in retirement is stressful, especially if one spouse wants to move, but the other does not. Revisiting the desires of what you both wanted to achieve as a younger couple will help bring focus to what direction both of you want to take now. Facing fears and embracing change is often more rewarding than you imagine. While it is prudent to research and evaluate before making a move, it is also essential to focus on the positive. Has your husband stated that he wants to retire and move? Read my article on why you should not compromise with your spouse, but have a Win-Win solution!